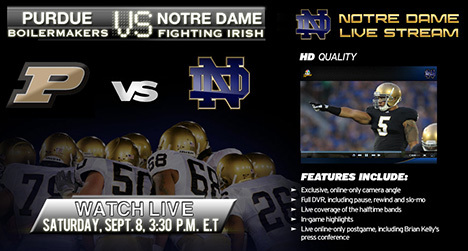 As it has for the past several seasons, NBC will once again live stream online all Notre Dame Fightin’ Irish home football games in 2013. The games boast HD Quality video with DVR controls, exclusive online-online camera angles, live coverage of the marching bands at halftime, in-game highlights,DVR functionality, and live coverage of head coach Brian Kelly’s post-game press conference. Best of all it’s free. If you’d prefer (or need) to watch the game on a mobile device, you’ll want to check out the NBC Sports Live Extra app for iOS and Android devices.